Came across this site and could not stop laughing look at these Kittlers what sort of plans are they making? Only a cat freak would post a topic like this! 1. It's kinda funny, what sane person doesn't like cat pics? Even if they are supposed to look like hitler. 2. 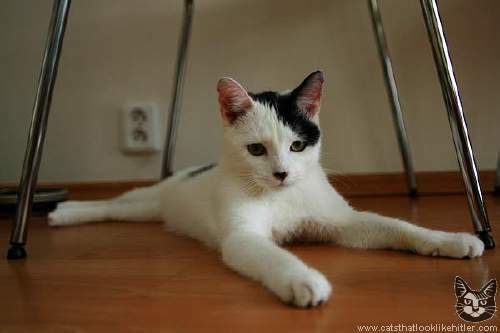 It's kind of disturbing, what sane person creates a website about cats that look like hitler? What's next, dogs that look like Stalin, fish that look like Mao, or hamsters that look like assad? 3. Most disturbingly, after about 15-30 minutes looking at that site I didn't see any cats that made me go "omg, that really does look/remind me of hitler!" . Kind of a let down tbh. Hitler was indeed one of the most evil persons who has walked the earth it's therefore important to joke about such persons. Some of the pics were actually quite funny. In all seriousness, I think I'm a bigger cat freak than you.